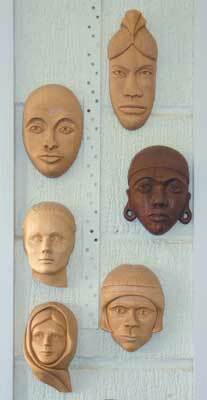 Masks have been discovered throughout the world in almost every culture since the earliest recorded civilisations. They have been made in many materials including metal, plaster, wood and wax, and have been used in rituals to frighten, threaten or amuse. 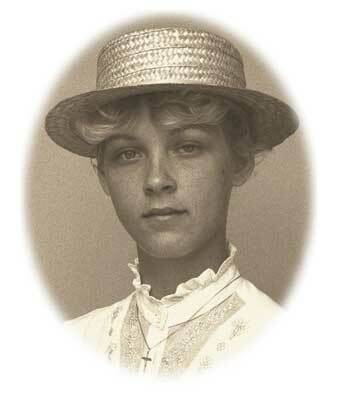 They are life-like and realistic as in a death mask, or stylised and exaggerated as in dance and theatre. Masks made today still have many of these attributes but the earliest examples of decorative ceramic masks appeared around the end of the 19th century. Wall masks of the idealised female became very popular during the first half of the 20th century when film stars were used as inspiration but with their best features, like flowing hair or luscious lips, often exaggerated. 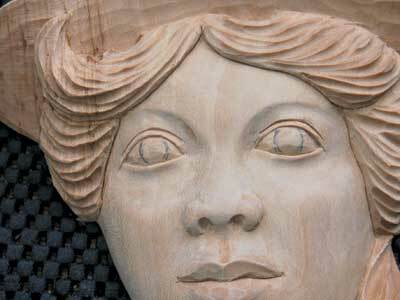 I find the human face fascinating to carve and this style of sculpture has many advantages. 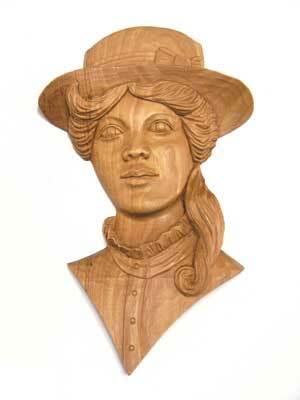 You will never be short of models, they only take modest pieces of timber, the faces do not have to be anatomically perfect, and they can be hung on the wall so do not take up shelf space. 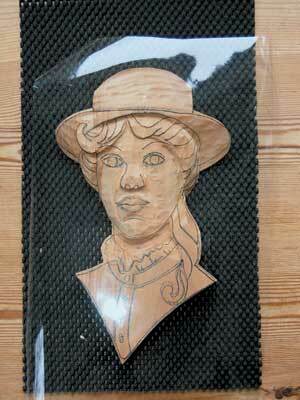 I have carved a few of these face masks from various illustrations (see photo 2) and for this project, I started with one of my own photographs, although I am not aiming to carve a portrait (see photo 1). I used a reasonable size print so that details could be seen, and traced the outline of the face and main features (see photo 3). I made a couple of prints of this line drawing, enabling me to make a few alterations like adding a curl of hair over the shoulder, covering the ears with hair, and enlarging the eyes slightly. When I was happy with my artistic efforts, I made another tracing (see photo 4), scanned it and enlarged it to actual carving size. I do make use of my PC, scanner and printer but these are not essential, they just make life a little easier. I used a piece of lime 255 x 165 x 25mm (10 x 6 1/2 x 1in) making sure the back was planed before I started, transferred the design to the timber using carbon paper, and cut round the outline with a bandsaw, cutting as close to the outline as possible (see photo 5). I started the carving on a piece of non-slip mat (see photo 6) but it could be fixed to a sheet of ply or MDF with glue dots or double sided tape, and clamped to a bench. 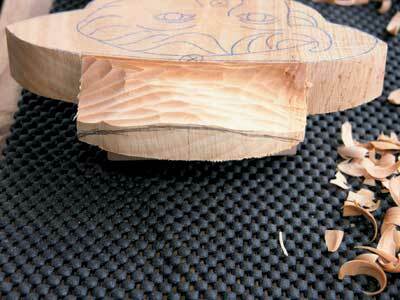 The advantage of the mat is that it is very easy to turn the carving as you work. 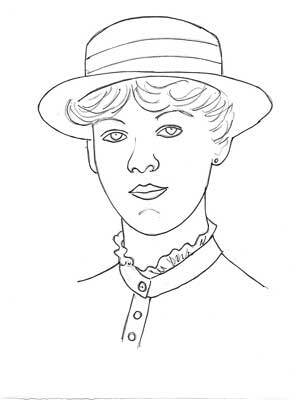 Mark the highest points (see photo 7), in this case the nose and the front brim of the hat. 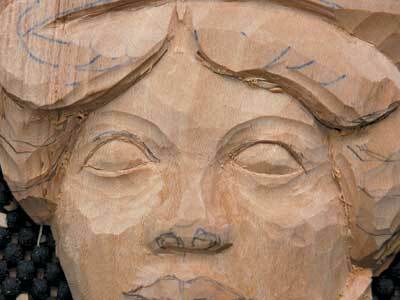 Remember this is a relief carving that is meant to be viewed from the front, like a painting, so depth will not be proportional and the profile will not look correct. 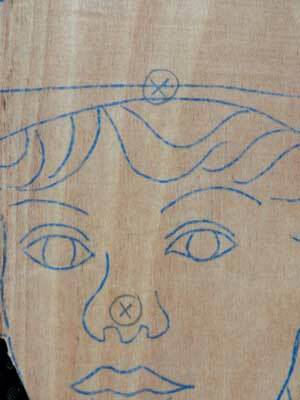 Quite soon the drawing will be carved away, so it is a good idea to copy the pattern onto acetate that can be held over the carving at any time to replace features (see photo 8). 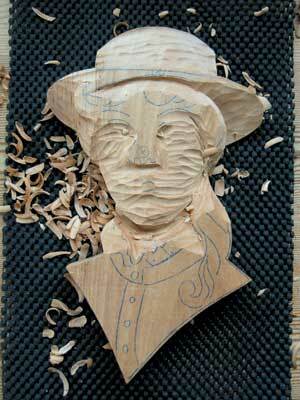 The order in which parts of the face are carved is not particularly important but I shaped the crown of the hat first, using a No.8 10mm gouge across the grain to separate it from the brim. I had marked the arc of the top of the hat on the end, making sure there was a smooth line right down to the edge of the timber (see photo 9). One thing to remember is that there should be no bandsaw cuts left on the edges of the finished mask except perhaps at the bottom V-shape where the blouse ends. 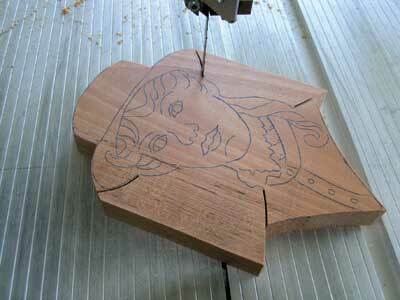 My next cuts, using a No.11 5mm gouge, outlined the face and hair line (see photo 10). 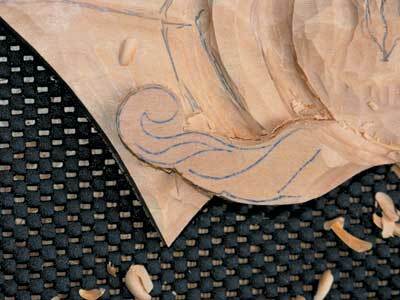 Avoid using a V-tool at this stage because the cut is too positive and does not allow for alteration. 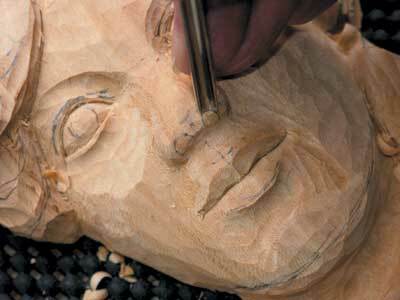 The next stage can be quite daunting because rounding the face cuts away all your drawing (see photo 11) and it is difficult to imagine that this will ever be an attractive face, but this is where the acetate comes into its own and the features can be redrawn in the right place (see photo 12). 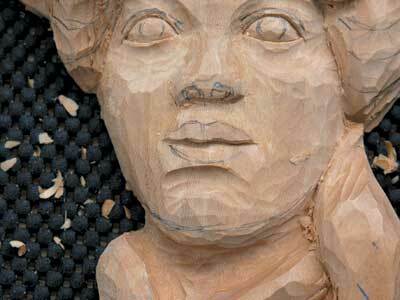 Don't worry about the work looking untidy - it is best not to carve detail until the overall shape is correct and you get a feel for the different levels. Because the whole face is only 25mm (1in) deep, some parts such as the neck, will have to be quite shallow to allow the chin and the collar frill to stand out. I decided to take some wood away from the blouse next so that the collar could stand out and I could carve the neck deeper - this in turn brought the chin out further. I cut round the lock of hair hanging over the shoulder (see photo 13) so that it would have some depth but still I did not carve detail. Even though the face is shallow, it must be remembered that the eyeball tips forward making the bottom of the eye deeper in the socket, so I made a deep groove under the eye before cutting in the detail (see photo 14). 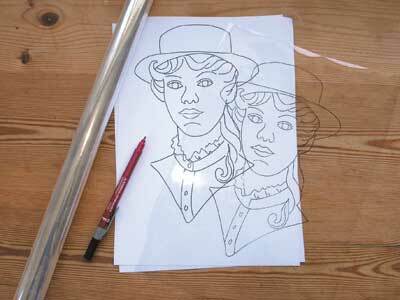 At every stage, I used the acetate to redraw the facial features as it is very easy to let the proportions slip. 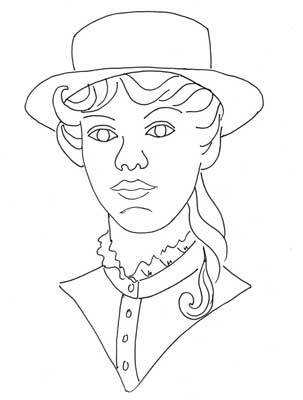 When carving the mouth, remember that the top lip protrudes over the lower lip (see photo 15) and the corners of the lower lip curl in under the top lip (see photo 16). 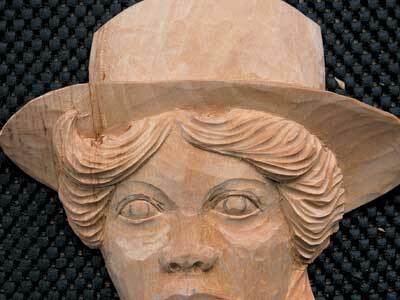 The whole of the mouth was carved with a No.3 8mm fish tail. The nostrils were created with a single cut of a gouge that fitted their shape (see photo 17) - you need to be really bold cutting the wings of the nose, going up from the mouth and digging in behind the nose (see photo 18). 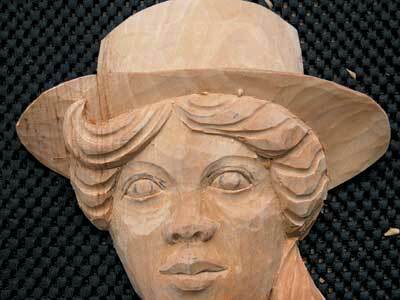 By now the face was beginning to look human, and I could almost forget about the original drawing while I concentrated on tidying the detail and carving the hair. 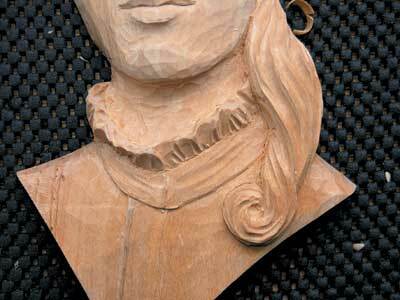 It is worthwhile holding the carving upright every now and then as this is how it will ultimately be viewed, and top lighting can make quite a difference to the appearance. 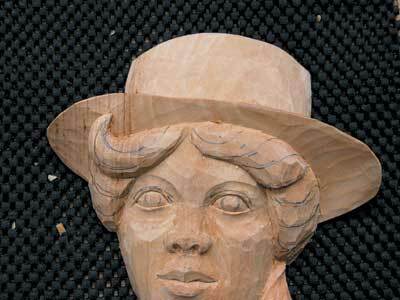 Before carving the hair, I needed to finish work on the brim of the hat as this would take the hairline back a bit, then once the hair was finished (see photos 19, 20 and 21), I carved detail on the frill of the blouse collar (see photo 22). I know the very mention of sanding gives some purists a touch of the vapours, but a smooth finish will take ten years off the age of the face, rather like looking at myself in a mirror without wearing my glasses! 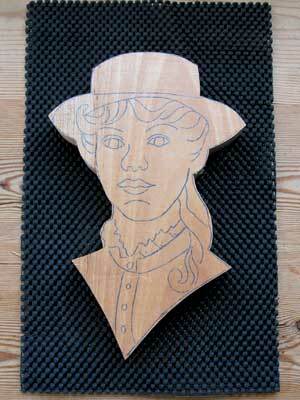 For some time it has been my ambition to carve without sanding but when I carve a young female, I am never satisfied that the tooling gives a soft enough finish, however I have only sanded the flesh, leaving everything else tooled, starting with 180grit and moving through 240 and 320 to 400. 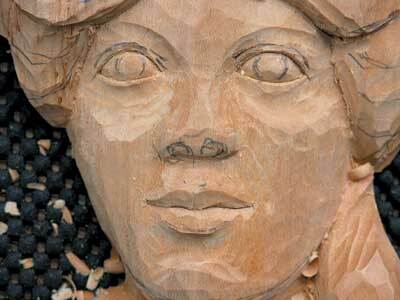 I left cutting eye lids and irises until after sanding because I wanted them to look crisp (see photo 23). 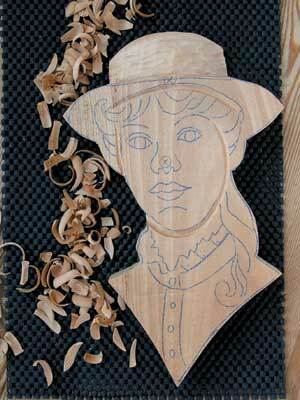 The only remaining details were a few buttons on the blouse and I decided to take an easy option by putting a band and bow round the hat instead of carving the straw effect seen on the original photograph. I made a small hole in the back so that the head tilted forward slightly when hung on the wall, then applied two coats of Danish oil and a final buff with neutral wax. 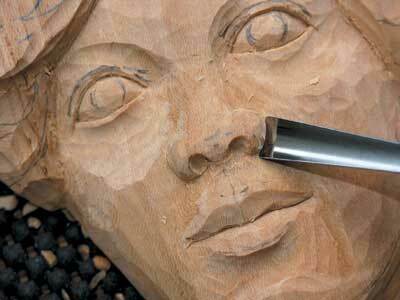 "When carving the mouth, remember that the top lip protrudes over the lower lip"